In this Case Study we have shared two versions of a user journey we recently created for a software project. This first is a journey which was put together from our initial workshops with the client. The goal of the software is to capture details for machinery on which their products get installed. The products which they install aim to detect and suppress fire within the machine in order to allow the operator enough time to exit the machine and / or address issues which may have other effects on the businesses which they work with. The initial journey was put together with the applicable Australian standards in mind for this equipment, and the industries in which the customers machinery operated; mining, industrial, farming etc. The focus was to try to force the user of the software to follow specific steps in order to meet these standards. After developing and testing the software we found that this very prescriptive approach to the user journey was too rigid for the majority of their users. 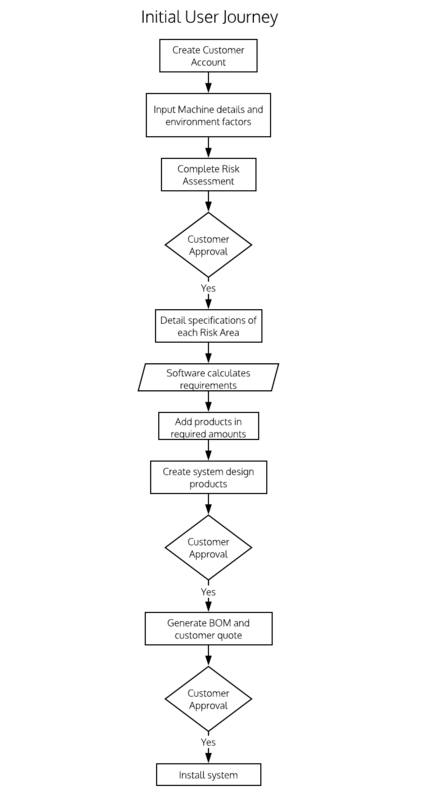 In reality the sales process worked by the customer reaching out to the software user (the supplier) and discussing options around installing their products. The supplier would then put together a quick version of a quote so that the customer could make a decision before going ahead. The supplier also used this opportunity to discuss the importance of meeting Australian safety standards encouraged to Customer to comply with them. After this initial quick path the supplier would then double back on their user journey and complete the rest of the standards requirements; completing a risk assessment, detailing the risk ratings of each potential risk and recommending reductions to improve these ratings. They also used the system to capture specifications so the system could calculate exact requirements for the product. These requirements are then used as a check to ensure that all required products have been included; number of nozzles, length of hozing, detention wire etc, the products are plotting on a diagram of the machine, and all products are pushed through to the customer quote. Aside from options to shortcut certain steps and come back to them later, one of the key findings was that we needed to allow users to be able to simplify the inclusion of the customer. When a new lead comes in they are not necessarily interested in having immediate access into the system, and may not be interested in logging in until much further down the sales process. A key update was to allow user to create a new system profile without first creating a customer and corresponding customer users. The effect of this revised user flow was to speed up the process of creating an initial quote, and allow for greater flexibility using the system and inviting customers into it. Want to know more about User Journeys? We can help you understand how your users are currently interacting with your software or website, and how to improve their experience so they can achieve their goals to become happier users. We focus on user centred design through running testing and feedback sessions with real users and look-a-like users to understand what drives and motivates them in their interactions.